Here we will go into some detail about English nouns and pronouns. Knowing what each of them is, makes it easier for you to understand the English language. 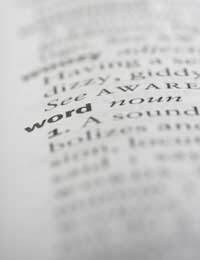 An English noun is what we use to show the name of a thing, a place, an idea or a person. Nouns can show actual objects (concrete objects), and show feelings or concepts (abstract concepts). Basically, a noun is whatever actually exists and can be named. Proper nouns in English are what name a specific thing, person or place. When used in English, they are always started with a capital letter. As they state an actual place or name, proper nouns are not usually plural. The word ‘the’ is not normally used with a proper noun. For example, if you were naming a country, you wouldn’t say “The England”. Instead, you would just say “England”. However, there is a slight exception to this particular rule. If the country name happens to include the words States or Republic, then you would include the word ‘the’. Common nouns are the nouns that describe everything else. So, everything that doesn’t fall into the proper noun category belongs in this one. In most circumstances, nouns become plural by adding an ‘s’ onto the end of it. Some nouns that end in ‘y’ can be pluralised by losing the ‘y’ and gaining ‘ies’. However, the nouns that end in a vowel and a ‘y’ can be pluralised by adding an ‘s’ onto the end. So, what do you do if the noun already ends in ‘s’? In these circumstances, you would just add ‘es’ onto the end to make the noun into a plural one. There are a few irregular nouns that have plural forms that seem to break all of the rules above. Some of these irregular nouns can create confusion for people learning English as a second language, and for native speakers. Pronouns are words that are used to refer to a noun that has already been used. Pronouns are also used instead of nouns already used in a sentence. One of the main reasons why we use pronouns is to avoid using the specific noun too much in any one sentence. We love cats, but we wouldn’t have more than one of them. We liked the look of the house, but we thought it was too close to the main road. Personal pronouns are the words that refer to people. Personal pronouns have an object and also a subject form. So, you could say: “We are going” and “Follow me”. They also have a first, second and third person form. Nouns and pronouns are an important part of the English language. They allow us to express ourselves and communicate clearly.